Happy Friday, Feasters! Have you finished cheer, cheering the red and the white yet? I know I haven’t. My beloved Swans’ club song has been ringing joyously in my ears all week. Ahh, the Sydney Swans winning the AFL Grand Final. Now that’s what I call a fantasy come true. Speaking of fantasy (Enjoy that segue? 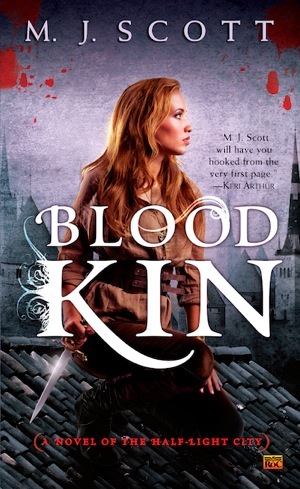 Perfect way to sneak in a mention of my footy team I thought), at Friday Feast we understand how important it is to keep our horizons broad, so this week we’re spinning off to another realm with Australian author MJ Scott. Humans, Fae, a Templar knight, shapeshifting beasts, treachery, how cool does that sound? Very, which I why I’m sure you want to buy yourself a copy right now. You know the drill, clickety-click on over to Amazon, Booktopia or the Bookdepository for the print copy and for the ebook, try Amazon (Kindle), Kobo, or discover a full list of retailers on MJ’s website. Thanks, Cathryn, for inviting me. Love a good chat about food! My grandfather was a baker. Up at ungodly hours of the morning making bread and biscuits and cakes and all the good things his bakery sold. Sadly he died when I was small, so I don’t have many memories of his actual food and I definitely didn’t inherit his ability to be up before the sun rises but I definitely got his baking bug. Luckily my mum was a firm believer in letting kids help in the kitchen so I was pretty young when I first learned how to stir cake batter or sift flour or beat eggs. The yen for baking has never left me since that time. Give me a recipe with flour and sugars and butter and eggs and I’m happy. Through in chocolate or cinnamon then I’m in heaven. I also like making bread though that’s for when I’m in the mood for something more involved. Being a baker, I tend to snoop on other people’s recipes and collect them. My recipe book is full of things titled “So and so’s cookies” or “X’s birthday cake”. Now, I can’t claim that any of my fantasy heroines are domesticated enough to be bakers but none of them would turn down a sweet treat…so if they did cook, they’d turn to something quick and indulgent. So in that spirit, I present a recipe that was long ago wheedled out of one of my friend’s mums, who used to make it for birthday parties. It’s chocolatey and easy to make and pretty fool-proof. It’s not entirely instant gratification because it has to set. Licking the spoon after scraping the bowl is, of course, mandatory because that’s half the fun of baking….seriously, I had a cookery teacher at school who used to tell us not to taste as we cooked…terrible advice…taste away, lick those beaters and enjoy. This is a recipe that can be tweaked to suit your tastes, so feel free to experiment…some tips at the end. Melt the butter in a large heavy bottomed saucepan. Remove from heat and leave for 10 minutes. While the butter is cooling, crush the biscuits. I do this in two batches in a food processor, one batch (about 2/3s) I whiz up very fine and the second batch I leave chunkier as I like biscuit chunks in my hedgehog. Please yourself. Once butter has cooled, add the sugar and cocoa and mix then add the eggs. Return to a low heat and stir until tiny bubbles start to form on the surface (don’t boil it, you just want it at the point where it starts to go a bit shiny and the sugar crystals have dissolved aka the mixture is smooth on your tongue if you taste a bit). Remove from heat and add the biscuits. Stir to combine. 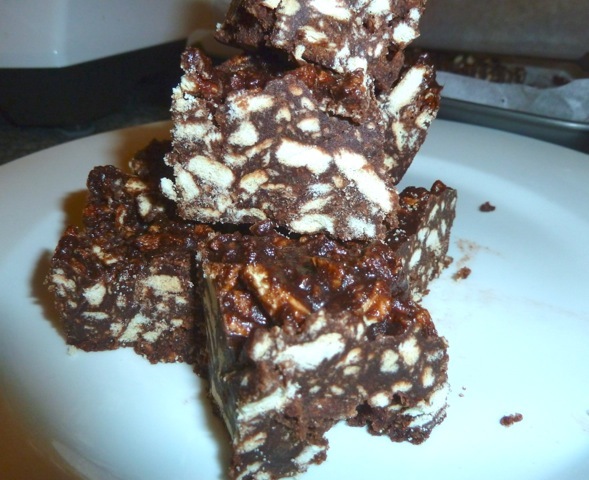 Pour into a greased or baking paper lined slice tin and refrigerate until set. Some people like to add a cup of choc chips to the top before setting. Once set, remove from tin, ice with your favourite chocolate icing (or not) and cut into chunks about two inches by an inch. Add a handful of sultanas or chopped nuts at the adding biscuit stage. Use a different biscuit type…probably anything that would work in a cheesecake base would work in this. HEDGEHOG!!!! How’s that for a blast from the past? I haven’t had any of that chocolatey-biscuity scrumptiousness for years, which is really very remiss because I’m sure it’s good for me. Speaking of good (ha! I’m on fire with the segues), what’s the best recipe you’ve ever “borrowed” off someone. 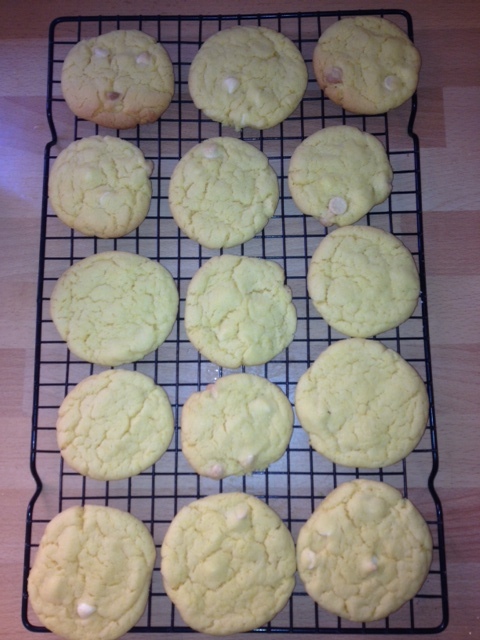 Mrs Coghlan’s lemon butter recipe has to be right up there for me, along with my mother-in-law’s ANZAC biccies. We all have them so why not admit yours? Go on, it’ll be cathartic! Now if you’d like to learn more about MJ Scott and her fabulous fantasies (the book ones, not her…er…others) then please visit her website. You can also connect via her blog, Facebook and Twitter. This entry was posted in Friday Feast and tagged Australian romance authors, Australian Romance Readers Association, Australian Writers, Baking, Blood Kin, Booktopia, Cathryn Hein, Cooking, Dark fantasy, Food, Friday Feast, Hedgehog, Kindle, M.J. Scott, promo, Recipes on October 5, 2012 by cathrynhein.